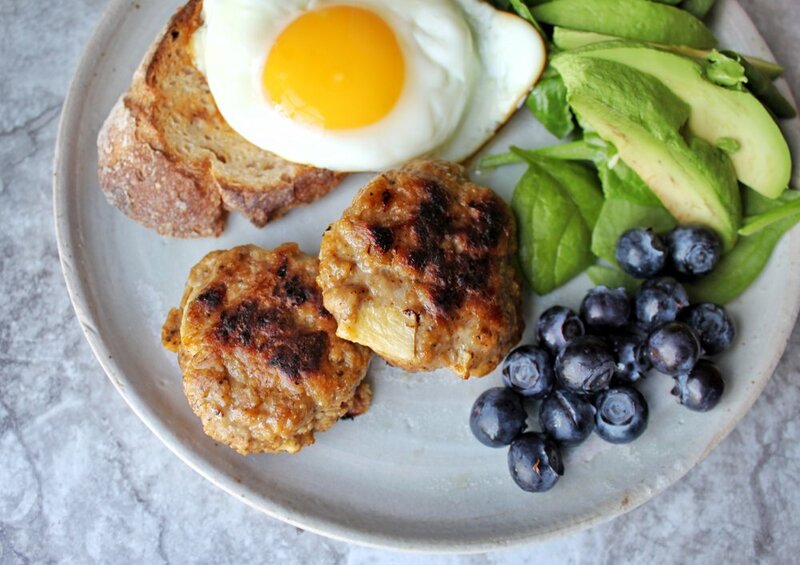 Have you ever thought about what’s in some of those store-bought sausage breakfast patties? Take a look at some of those ingredients next time you’re at the grocery store. I made these Spicy Apple Turkey Sausage patties on a whim, after feeling inspired by a similar recipe I saw on Ambitious Kitchen! Why has it taken me so long to make my own sausage breakfast patties? These are soooo easy to make, and are absolutely delicious. Best part? You know what’s in them! I hope you enjoy these little breakfast delights. Feel free to play around with flavors, they’re super versatile! Combine all ingredients in a large mixing bowl. Mix ingredients thoroughly, until well-incorporated. Using damp hands, form golf ball-sized balls, and place them on a parchment-lined baking sheet. Flatten with moistened fingers to form "patty” shape. Bake for 25-35 minutes, or until meat is no longer pink. Flip patties halfway.